Delivery time: In stock, delivered within a week. Free worldwide delivery. Price in USD. Change currency. Want to be more mindful? We're always forgetting. That's why we created these mindful wristbands: a constant reminder to enjoy the here and now. 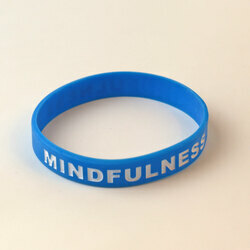 Our wristband comes in only one colour: blue. Why? Because we went out and researched the colour that produced the most calming effect on anxiety. Blue, specifically the blue we have used here, won the day. Made of durable silicone this band will stretch around your wrist. At 202mm, it will fit even the most-well-built arms. Being made from silicone, rather than latex, there is no allergens to worry about. The product does not have to be in it's original condition: we want you to use it!